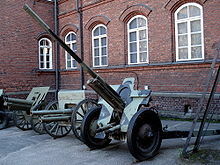 The following is a list of Soviet military equipment of World War II which includes artillery, vehicles and vessels. World War II was the deadliest war in history which started in 1939 and ended in 1945. Following political instability built-up in Europe from 1930, Germany, which aimed to dominate Europe, attacked Poland on the 1st of September 1939, marking the start of World War II. The USSR (Soviet Union) joined the attack on Poland from 17th September 1939. The war in Europe ended on 8th May 1945 with the capitulation of Germany to the allied (including Soviet) forces. Soviet combat knife that was produced after the Winter War in 1940. Soviet bayonet knife issued with the AVS-36 automatic rifle. The fact that the AVS-36 was used in very limited numbers; most without the bayonet; made it very rare. Nagant M1895 Revolver 7.62×38mmR Russian Empire 7-round cylinder. Tokarev TT-33 Semi-automatic pistol 7.62×25mm Tokarev Soviet Union 8-round magazine. Widely used by officers, did not fully replace the Nagant M1895. Mauser C96 Semi-automatic pistol 7.63×25mm Mauser German Empire 10-round internal magazine. Small amount captured from German forces. Mosin–Nagant M1891/30 Bolt-action rifle / Sniper rifle (with 3.5× PU scope attached) 7.62×54mmR Soviet Union 5-round internal magazine. 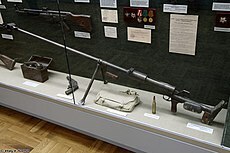 Most widely used bolt-action rifle by the Red Army. Mosin–Nagant M1938 Carbine Bolt-action rifle 7.62×54mmR Soviet Union 5-round internal magazine. Mosin–Nagant M1944 Carbine Bolt-action rifle 7.62×54mmR Soviet Union 5-round internal magazine. Tokarev SVT-38 Semi-automatic rifle 7.62×54mmR Soviet Union 10-round magazine. Tokarev SVT-40 Semi-automatic rifle / Sniper rifle (with 3.5× PU scope attached) 7.62×54mmR Soviet Union 10-round magazine. Most widely used semi-automatic rifle by the Red Army. Federov Avtomat Battle rifle 6.5×50mmSR Arisaka Russian Empire 25-round magazine. Deployed during the Winter War from stockpiles due to a shortage of submachine guns. Simonov AVS-36 Battle rifle 7.62×54mmR Soviet Union 15-round magazine. Produced from 1934–1940, it was mostly withdrawn in 1941 due to issues. Used primarily during the Winter War. Tokarev AVT-40 Battle rifle 7.62×54mmR Soviet Union 10-round magazine. Modified SVT-40 with a different firing selector. Produced from May 1942 until halted in the summer of 1943 due to mostly uncontrollable automatic fire and breakage. 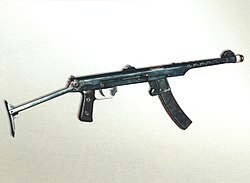 PPD-34 Submachine gun 7.62×25mm Tokarev Soviet Union 25-round magazine. 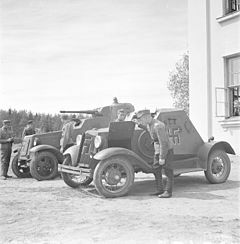 Based and adapted from the Suomi KP/-31, was not produced in larger quantities until 1937-1939. PPD-34/38 / PPD-40 Submachine gun 7.62×25mm Tokarev Soviet Union 71-round magazine. PPSh-41 Submachine gun 7.62×25mm Tokarev Soviet Union 35, 71-round magazine. Most widely used Soviet submachine gun. PPS-42 / PPS-43 Submachine gun 7.62×25mm Tokarev Soviet Union 35-round magazine. Thompson M1928A1 Submachine gun 11.43×23mm (.45 ACP) United States 20, 30, 50-round magazine. 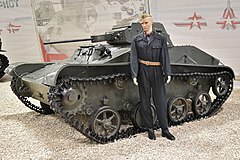 Supplied by the United States during the Lend-Lease program. M50 Reising Submachine gun .45 ACP United States 12, 30-round magazine. Supplied by the United States during the Lend-Lease program. DP-27 / DP-28 Light machine gun 7.62×54mmR Soviet Union 47-round magazine. 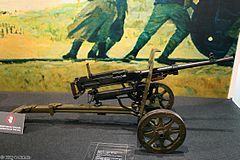 Most widely used light machine gun by the Red Army. DS-39 Medium machine gun 7.62×54mmR Soviet Union 250-round belt. 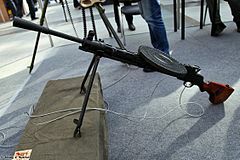 SG-43 Gorunov Medium machine gun 7.62×54mmR Soviet Union 200, 250-round belt. PM M1910 Heavy machine gun 7.62×54mmR Russian Empire 250-round belt. DShK 1938 Heavy machine gun 12.7×108mm Soviet Union 50-round belt. RPD Light Machine Gun 7.62x39mm Soviet Union 100-round belt. Saw limited service during the end of WW2. Bren Gun Light Machine Gun 303 British United Kingdom 30-round detachable box magazine. Supplied by the British Empire during the Lend-Lease program. Limited usage during World War II. F1 grenade Fragmentation grenade 55mm Russian Empire Widely produced grenade. Nicknamed the "limonka" (lemon). Produced in 1942 to replace the complex RGD-33. Soviet partisans made copies of it when they were located behind enemy lines. Effective against tanks up to 20mm of armour. Improved version of the RPG-40. Effective against tanks up to 75mm of armour. RPG-6 Anti-tank grenade 103mm Soviet Union Improved version of the RPG-43. Effective against tanks up to 100mm of armour. Grenade launcher attachment for Mosin-Nagant rifle. There were four other versions of the grenade besides the main high explosive one. TM-35 mine Anti-tank mine Pressure Soviet Union 2.8 kg of TNT. TM-41 mine Anti-tank mine Pressure Soviet Union 3.9 kg of Amatol or TNT, short cylinder with the entire top surface being used as a pressure plate. TM-44 mine Anti-tank mine Pressure Soviet Union 5.4 kg of Amatol, broadly similar to the earlier, smaller, TM-41 mine. 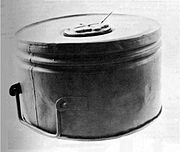 TMD-40 mine Anti-tank mine Pressure Soviet Union 3.6 kg of Amatol. 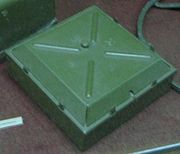 TMD-44 / TMD-B mines Anti-tank mine Pressure Soviet Union 9-9.7 kg of Amatol. 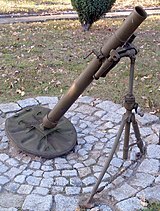 76 K/DRP Recoilless rifle 76mm Soviet Union Used during the Winter War. It was designed by L.V. Kurchevsky in 1930 and entered service in 1932. 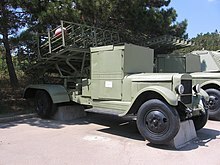 It was able to be mounted on GAZ-A trucks, becoming SU-4 self-propelled guns. PTRD-41 Anti-tank rifle 14.5×114mm Soviet Union Single-shot reloadable rifle. PTRS-41 Anti-tank rifle 14.5×114mm Soviet Union 5-round internal magazine. M1 Bazooka Recoilless anti-tank rocket launcher 60 mm United States Single-shot reloadable launcher. Small amounts supplied by the United States during the Lend-Lease program. PIAT Anti-tank projectile launcher 83mm United Kingdom Single-shot reloadable launcher. Supplied by the British Empire during the Lend-Lease program. Panzerschreck Anti-tank rocket launcher 88mm Nazi Germany Single-shot reloadable launcher. Captured from German forces. 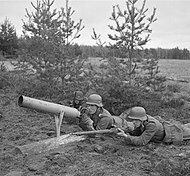 Panzerfaust Anti-tank recoilless gun 149mm Nazi Germany Single-shot disposable launcher. Some were captured in 1944, while many were captured in 1945 from retreating German soldiers and Volkssturm. FOG-2 Flamethrower Soviet Union From 1941, around 15,000 were produced and used during World War 2. ROKS-2 / ROKS-3 Flamethrower Soviet Union Produced from 1935-1945. 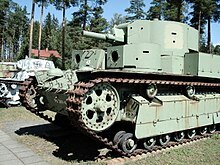 Used also during the Soviet-Finnish War (1941—1944). Improvised incendiary bottles that were thrown at armoured vehicles. 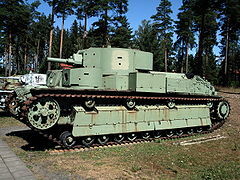 First widely used by Finnish troops against the Soviets during the Winter War. Ampulomyot Incendiary anti-tank ampulla-thrower Soviet Union 125mm incendiary spherical glass projectile. Use of it was limited in 1941, and became obsolete by 1942. Zuckermann's bottle-thrower Incendiary anti-tank bottle launcher Soviet Union Attachment for Mosin-Nagant rifles. Special bottles with incendiary mixtures were used. The bottles were produced in 1942, but became obsolete once Red Army troops were equipped with more anti-tank guns and rifles. 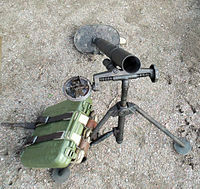 It was a lighter version of the M1938 mortar made for Soviet mountain troops. 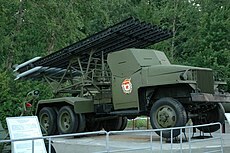 BM-13 "Katyusha" 132mm Multiple rocket launcher Soviet Union Most widely used multiple rocket launcher by the Red Army. It became known as "Stalin's organ" by German soldiers. Smaller rocket launchers that were mounted on T-40 and T-60 light tanks. BM-31 "Andryusha" 300mm Multiple rocket launcher Soviet Union Heavy rocket launcher with 12 rocket tubes which used the chassis of a ZIS-12 and the American Lend-Lease Studebaker US6 U3 truck. 45mm 20-K tank gun 45mm Anti-tank gun Soviet Union Many tanks and other armoured vehicles later used it as their main armament. 76.2 mm L-10 tank gun 76mm Anti-tank gun Soviet Union The main armament of the T-28 tank. L-11 76.2 mm tank gun 76mm Anti-tank gun Soviet Union The main armament of the T-34 Model 1940 tank. F-32 tank gun 76mm Anti-tank gun Soviet Union The main armament of the KV-1 Model 1940 tank. F-34 tank gun 76mm Anti-tank gun Soviet Union The main armament of T-34-76 and KV-1 tanks. D-10 tank gun 100mm Anti-tank gun Soviet Union The main armament of the SU-100 tank destroyer. 76 mm divisional gun M1936 (F-22 76mm Field gun Soviet Union Used during the Winter War. 76 mm mountain gun M1909 76mm Mountain gun France It became obsolete after it was replaced with several other mountain guns. 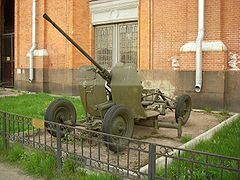 152 mm gun M1935 (Br-2) 152mm Heavy gun Soviet Union It was used by the Red Army in the Battle of Kursk and Battle of the Seelow Heights. 152 mm howitzer M1909/30 152mm Field howitzer Soviet Union Most numerously used 152mm howitzer by the Red Army. 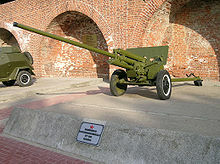 203 mm howitzer M1931 (B-4) 203mm Heavy howitzer Soviet Union It was used by the Red Army in the Battle of Berlin. 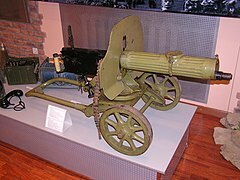 37 mm anti-tank gun M1930 (1-K) 37mm Anti-tank gun Soviet Union The gun was closely related to the German PaK 35/36. 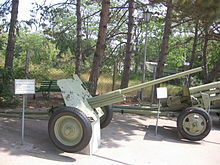 37 mm automatic air defense gun M1939 (61-K) Air-defence gun 37×250mmR Soviet Union 200-rounds. 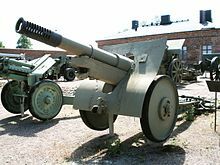 45 mm anti-aircraft gun (21-K) Semi-automatic air-defence gun 45×386mmSR Soviet Union It was used by the Soviet Navy for most of their ships from 1934 as its primary light anti-aircraft gun until replaced by the fully automatic 37 mm 70-K gun from 1942 to 1943. 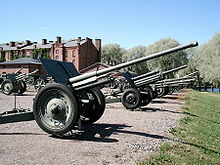 37 mm 70-K gun Automatic air-defence gun 37×250mmR Soviet Union Naval version of 37mm M1939 (61-K). 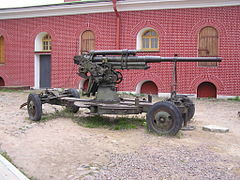 85 mm air defense gun M1939 (52-K) Semi-automatic air-defence gun 85×558mmR Soviet Union It was successfully used against level bombers and medium/high altitude targets. 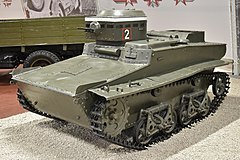 T-27 Tankette Soviet Union 2,157 (1941) The main armament was the 7.62mm DT light machine gun. Some were captured by Romanian forces. 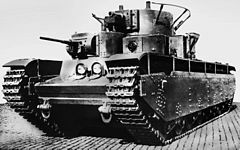 T-18 (MS-1) Light tank Soviet Union Based on the French Renault FT tank. T-26 Light tank Soviet Union Interwar period light tank that became the most numerous tank during the German invasion. T-60 Light scout tank Soviet Union Replacement of the obsolete T-38 and T-30 tanks. 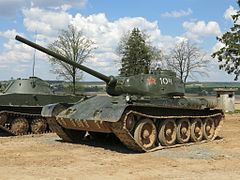 T-34-76 Medium tank Soviet Union One of the most widely used tanks in the Red Army. 35,120 were produced. 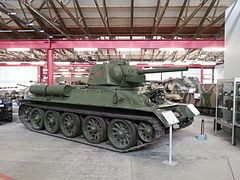 T-34-85 Medium tank Soviet Union It was the most influential and produced tank in World War 2. 48,950 were produced. 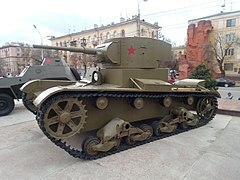 T-35 Heavy tank Soviet Union During the war, they were slow and proved to be mechanically unreliable. 61 were produced. 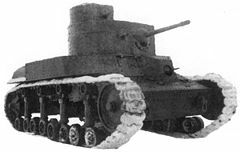 SMK Heavy tank prototype Soviet Union Only one was produced, it was used during the Winter War. It was replaced by the KV tank series. 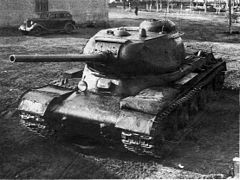 T-100 Heavy tank prototype Soviet Union Two were produced. There were unsuccessful trial uses of it during the Winter War. It was replaced by the KV tank series. 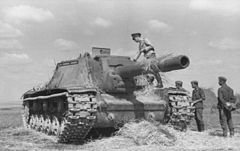 KV-1 Heavy tank Soviet Union Known for its strong armour, it became known as the "Russischer Koloss" – "Russian Colossus" by the German Army. 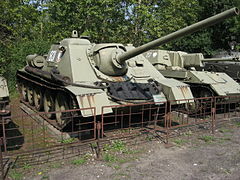 KV-2 Heavy tank / Assault gun Soviet Union The main armament was the 152mm howitzer. Due to its combat ineffectiveness, only 334 were produced . 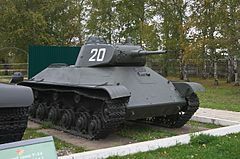 KV-85 Heavy tank Soviet Union It became the basis for the IS Series tanks. 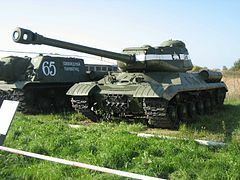 IS-1 Heavy tank Soviet Union The IS series was a successor to the KV tank series. 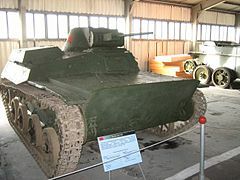 IS-1 was a prototype version, which had 130 produced. 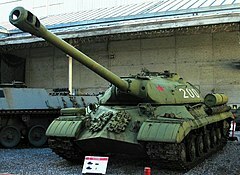 IS-2 Heavy tank Soviet Union 3,854 IS-2s were produced. 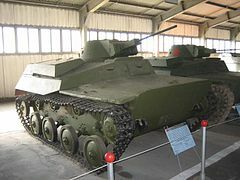 IS-3 Heavy tank Soviet Union 2,311 IS-3s were produced. 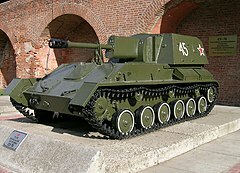 SU-5-1 / SU-5-2 / SU-5-3 Self-propelled gun Soviet Union A self-propelled gun that was on the T-26 light tank chassis. SU-5-1 was armed with the 76.2mm divisional gun mod. 1902/30. SU-5-2 was armed with the 122mm howitzer mod. 1910/30. 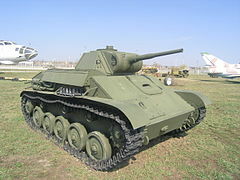 SU-5-3 Self-propelled gun Soviet Union It was on the T-26 chassis. Equipped with the 152mm mortar M1931. 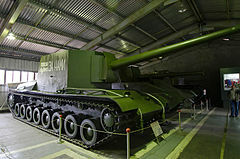 SU-14 Self-propelled gun prototype Soviet Union One was built as a prototype. The main armament was the 152 mm gun (U-30 or BR-2). 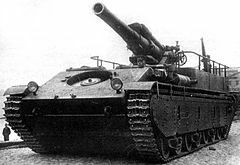 SU-100Y Self-propelled gun prototype Soviet Union One prototype was made, based on the SU-100 tank and was used during the Winter War. 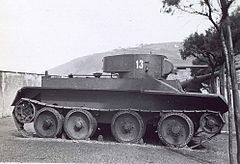 The main armament was the 130mm Naval Gun B-13. 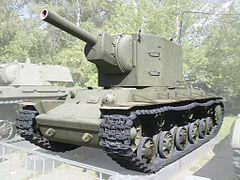 SU-26 Self-propelled gun Soviet Union Equipped with a 76 mm regimental gun M1927. 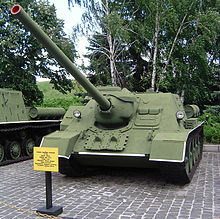 SU-76 / SU-76M Self-propelled gun Soviet Union The second most produced Soviet vehicle of World War 2, after the T-34. Equipped with a 76 mm ZIS-3Sh gun. SU-4 Wheeled self-propelled anti-tank gun Soviet Union On the chassis of an extended GAZ-A. It was equipped with a 76 K/DRP recoilless gun. SU-12 Wheeled self-propelled anti-tank gun Soviet Union On the chassis of a GAZ-AAA. 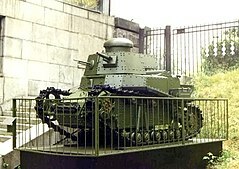 It was equipped with a 76 mm regimental gun M1927. 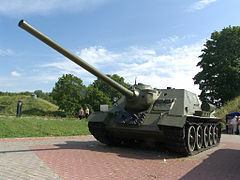 SU-11 Self-propelled air-defence gun 37×250mmR Soviet Union It was equipped with the 37mm automatic air defence gun (61-К). 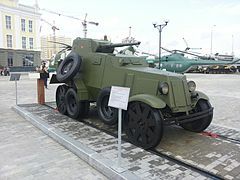 ZSU-37 Self-propelled air-defence gun 37×250mmR Soviet Union It was equipped with the 37mm automatic air defence gun (61-К). BA-27 Armoured car Soviet Union First Soviet series-produced armoured car. The main armament was the 37mm Puteaux SA 18. Some were captured during the German invasion of the Soviet Union. 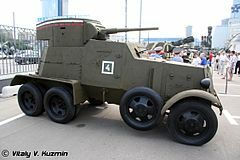 D-8 Armoured car Soviet Union The main armament was two 7.62 DT light machine guns. It was used during the Winter War. 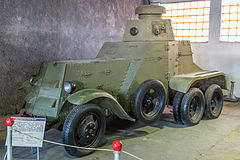 FAI Armoured car Soviet Union Replacement for the D-8 armoured car. 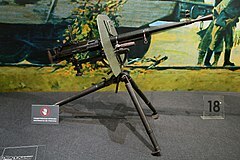 The main armament was the 7.62 DT light machine gun. 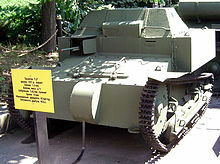 BA-I Armoured car Soviet Union Its main armament was the 37mm 7K gun. The design of the BA-I started a series of heavy armoured cars of Izhorsky plant. These included: BA-3, BA-6, BA-9, and BA-10. 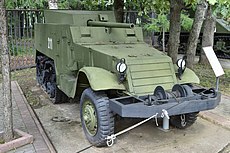 BA-3 Armoured car Soviet Union The main armament was the 45mm gun 20-K.
BA-6 Armoured car Soviet Union Very similar to the BA-3. 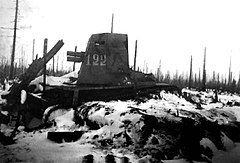 Both were used against the Japanese in the Battle of Khalkhyn Gol, in the Finnish Winter War, and against the Germans in the early stages of the Eastern Front. 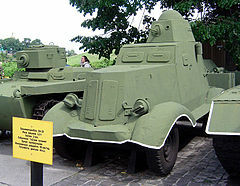 BA-10 Armoured car Soviet Union The main armament was the 45mm gun 20-K.
BA-11 Armoured car Soviet Union The main armament was the 45mm gun 20-K.
BA-20 Armoured car Soviet Union Special armoured version of the GAZ-M1 passenger car. 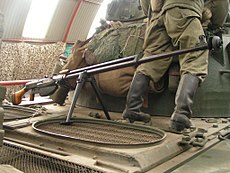 The main armament was the 7.62 DT light machine gun. BA-64 Armoured scout car Soviet Union Based and adapted from a captured German Sd.Kfz. 221. 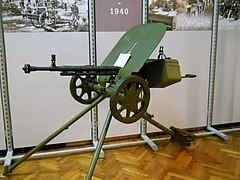 The main armament was the 7.62 DT light machine gun. 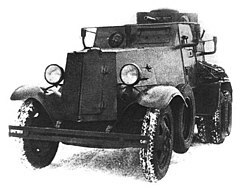 BA-30 Half-track Soviet Union A small number of them were produced. The main armament was the 7.62 DT light machine gun. GAZ-AA Truck Soviet Union Soviet produced vehicle licensed from the Ford AA model of 1930. GAZ-64 Light utility vehicle Soviet Union 2,500 were produced during the war. The focus switched to building armoured BA-64s, with the availability of American made Jeeps. PMZ-A-750 Heavy motorcycle Soviet Union The first heavy motorcycle manufactured in the Soviet Union. Used during the Winter War with unsatisfactory results. TIZ-AM-600 Heavy motorcycle Soviet Union Used during the Winter War with unsatisfactory results, it was considered an outdated design. M-72 Heavy motorcycle Soviet Union Motorcycle meant to replace the PMZ-A-750 and TIZ-AM-600. In the Eastern Front, motorcycles were produced at both the IMZ and GMZ motorcycle plants. All sidecars for both the M-72 and American Lend-Lease bikes were produced at the GMZ. 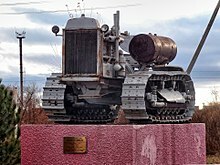 S-60 Tractor Soviet Union Heavy tractor with a strong engine meant to haul artillery. S-65 Tractor Soviet Union Replacement of the S-60 for towing heavy weapons. Many of these and S-60s were captured by the German Army during their invasion. T-20 Armoured tractor Soviet Union These were most often used to haul artillery, carry troops, and unintentionally as a Tankette/Gun Carrier/APC. 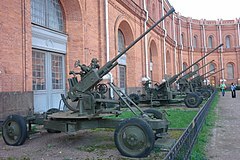 It was used during the Winter War and the first half of World War 2. They were often captured by the German Army and fitted with Pak guns. M3A1 (Stuart III) Light tank United States 1,233 From 1941-1945, 1,676 were supplied by the United States as a part of the Lend-Lease. 443 were lost at sea. 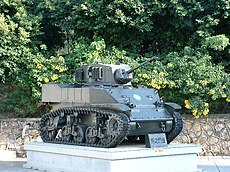 M5 (Stuart VI) Light tank United States 5 5 were supplied. M24 Chaffee Light tank United States 2 2 were supplied in 1944. M4 Sherman medium tank United States 4,102 4,102 were suppiled, of these, 2,007 were the original 75 mm main gun model, 2,095 were with 76 mm tank gun. Valentine tank Infantry tank United Kingdom 3,462 2,074 supplied by the UK, 1,388 supplied by Canada. 320 were lost at sea by both countries. 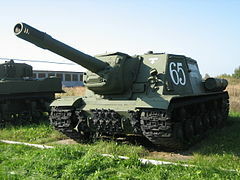 (SU-57) Tank destroyer United States 650 650 were supplied. On the chassis of the M3 Half-track equipped with a 57mm gun M1. It was designated as the SU-57 by the Soviet military. ^ Sami Korhonen (1 November 2000). 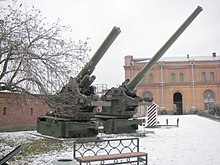 "Soviet artillery used the during Winter War". The Battles of the Winter War. Retrieved 22 April 2018. 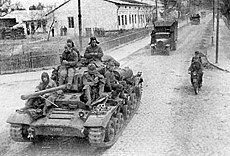 ^ a b c d "Lend-Lease Armoured Vehicles supplied to the Red Army 1941-1945". WW2 Weapons. 18 December 2017. Retrieved 13 May 2018. ^ Lend-Lease Shipments: World War II, Section IIIB, Published by Office, Chief of Finance, War Department, 31 December 1946, p. 8.